To Russia and the Russian media, the pseudo-elections of November 2 in the so-called ‘DNR’ and ‘LNR’ are free and democratic, as evidenced by statements made by ‘international observers.’ According to some Russian media, these pseudo-elections are considered legitimate even in the EU Parliament. The Russian media also published a report about 13-year-old Stas, whom National Guard servicemen allegedly forced to spy. “OSCE mission representatives who work in Donetsk visited the polling station in school number 1 located near their hotel. Earlier on Saturday, a delegation of international observers arrived in Donbas, where it will observe the elections in the declared Donetsk and Luhansk ‘People’s Republics’,” reports Russian newspaper Vzglyad. The OSCE officially denied this information. “There is no observation from the OSCE at the so-called elections in Eastern Ukraine on Sunday, November 2, and there is no monitoring at voting stations,” stated OSCE General Secretary Lamberto Zanier. However, it turned out that the OSCE representatives, as they were called by Russian media, are actually foreigners, particularly, as online magazine Interpreter reports, among these ‘observers’ there are at least 17 representatives of ultra-right parties who came to Ukraine probably from Russia in order to observe the unacknowledged pseudo-elections on November 2. Many of these observers are cited by the Russian media. For example, live on Rossiya-24, it was said that: “Despite all of Kyiv’s claims that the elections in Donbas are illegitimate, the EU Parliament, as it turned out, does not think so at all. This is what one of the members who decided to observe the voting process in the self-proclaimed republics told us.” They were talking about EU Parliament member Jean-Luc Schaffhauser who came to Donetsk oblast illegally. The official statement of the Ukrainian Foreign Affairs Ministry calls such ‘observers’ “self-declared,” and emphasizes that they are representatives of “marginal political parties.” The MFA also stated that these people will be declared personae non grata in Ukraine. The Ukrainian MFA emphasizes that not a single authoritative international organization and not a single democratic state of the world acknowledges these pseudo-elections and did not send any observers to them. This is not the first time Russian media cite fake observers, claiming they are part of the OSCE. As such, for example, on September 30 the newspaper Vechernyaya Moskva published an interview with Latvian political expert Ejnars Graudinsh, calling him an “OSCE observer.” The OSCE representatives in Ukraine claimed he had nothing to do with the organization. Russia acknowledged the so-called ‘DNR’ and ‘LNR’ ‘elections.’ “We respect the expression of will of the citizens of the Southeast. The chosen representatives received a mandate to solve practical issues to renew normal life in the region,” notes the statement of the Russian MFA. What is also interesting is the fact that the hosting and domain name of the website of the so-called ‘Central Electoral Committee’ of the so-called ‘republics’ was registered on Russian territory, in Moscow. 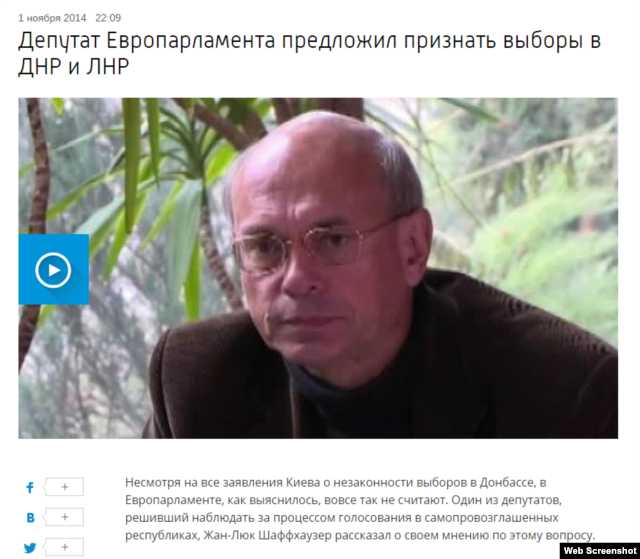 The same website has published statements of the so-called ‘head of the DNR CEC’ Vladislav Gordeyev. After the so-called ‘elections’ he stated that Donbas has to separate from Ukraine once and for all. “The elections were legitimate and went without essential violations which could have influenced the results. Now we have a legitimate government, Donbas is no longer part of Ukraine whether someone likes it or not,” he claims. Such a statement is in direct contradiction to the Minsk accords, as they spoke about these territories only within Ukraine. Russian TV channels LifeNews and NTV shared a report on the same topic: about a 13-year-old boy from the village of Chervony Lyman of Donetsk oblast. The report claims that soldiers of the Ukrainian National Guard allegedly gave him narcotic injections and forced him to go to the pro-Russian mercenaries to later report on the whereabouts of their roadblocks. “A teenager from Chervony Lyman of Donetsk oblast spoke on camera about things that even an adult would find difficult to imagine. The student told about how Ukrainian soldiers came to their home, beat his mother, put a gun to his father’s temple and ordered him to tell them the locations of the rebellion bases. Otherwise, they promised to kill his parents. The boy remembers the servicemen giving him a shot, his head spinning and then taking his bicycle almost 50 kilometers to reach the ‘rebels’,” says the report. It turned out that nobody had kidnapped the boy. He is Petrov Stanislav Serhiyovich from Chervony Lyman who went missing on October 12. As noted in the investigation data, he has a slight degree of mental retardation. The boy is being searched for by the Chervonoarmiysk MIA headquarters of Ukraine in Donetsk oblast. The reports are also contradictory about the traces of the injections the National Guard servicemen allegedly gave to the boy. In one report they are on Stas’ right arm, in the other – on his left. Radio Free Europe/Radio Liberty (RFE/RL) is a broadcaster funded by the U.S. government that provides "news, information, and analysis" to countries in Eastern Europe, Central Asia, and the Middle East "where the free flow of information is either banned by government authorities or not fully developed."